Police appeared to have cracked another major carjacking ring in raids at Kuru Kururu, Soesdyke/Linden yesterday, arresting an ex-cop and six others and seizing at least two cars and a truck laden with spares. The ten-hour operation was carried out by ‘A’ Division ranks and concluded around 03.00 hrs yesterday. “The suspects are reportedly employed by an ex-policeman, who is in custody along with others assisting with the investigations,” a release stated. Yesterday’s operation occurred just three days after police seized several stolen vehicle parts during raids at North Vryheid’s Lust, East Coast Demerara and Monument Hill, Kuru Kururu, Soesdyke/Linden Highway. A former policeman, a husband and wife and four women were detained in that raid. Police believe that the vehicles were stolen during carjackings and stripped of their parts which are being sold. The raid at North Vryheid’s Lust was carried out by ranks from the Major Crimes Investigation Unit. They raided the home of a 29-year-old taxi driver and his 25-year-old wife. They found several car mirrors—with engraved licence plate numbers—doors, lights, wipers and other vehicle parts for Toyota Allion, Spacio and Premio motor cars. As a result, the couple was taken into custody after the husband provided police with conflicting stories as to why the suspected stolen vehicle parts were piled up at his residence. An ex-policeman and four women were detained after police ranks in ‘A’ Division went to a property at Monument Hill, Kuru Kururu and conducted a search during which a quantity of vehicle parts and several vehicles suspected to be stolen or unlawfully obtained were found. The items have been lodged at the Timehri Police Station. In one of several photographs released by the police, a number of vehicle seats, a trunk door, steering wheel and other parts were scattered under a shed. The other photos depict a Toyota Runx bearing number plate PPP 5957, a grey Nissan Bluebird with license plate PSS 4593, all of which, were seized by police ranks during the raid at Kuru Kururu. 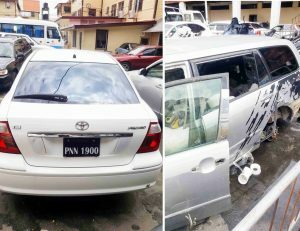 The discovery of the stolen vehicles and parts would come at a time when the police, only last month, seized four cars from a taxi service base at Herstelling, East Bank Demerara. According to information received, police ranks visited the taxi base on January 21, last, to look for a crashed vehicle which was taken to the mechanic shop operated by Ganesh James, who is currently on $100,000 bail for hijacking a car. It was there that the ranks found four vehicles, including two crashed cars in which the chassis numbers had been tampered with. The two crashed cars along with a Toyota Fielder Wagon and a Toyota Allion were seized. James was arrested late last year after he allegedly conspired with others to hijack a car valued $2.1M from Ramesh Ramoutar on December 14, 2017 at Better Hope, East Coast Demerara. Recently, there have been a number of carjacking with Toyota Allion and Premio motor cars being the most targeted. For last year, 25 vehicles were hijacked, including three Carina 212 and a Toyota Spacio.